Panic attack symptoms sufferers may have had some weird feelings and are confused about what they are experiencing? You may be researching what is happening to you and asking “What is a panic attack and what are the panic attack symptoms?” The first step is always to seek medical advice as there may be something physically wrong with you. If the tests come back negative and the doctor says there is nothing wrong with you, then contact me through the skype/phone link at top of this page. 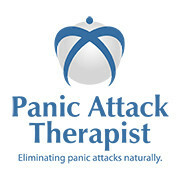 Panic attack symptoms can be very frightening and distressing. Symptoms tend to occur very suddenly, without warning and often for no apparent reason. Panic attack symptoms can also have unpleasant physical affects, and they can also be accompanied by thoughts of fear and terror. For this reason, people with panic disorder start to fear the next attack, which creates a cycle of living in ‘fear of fear’ and adds to the sense of panic. Sometimes, panic attack symptoms can be so intense they can make you feel like you are having a heart attack. However, it is important to be aware that panic attack symptoms such as a racing heartbeat, or shortness of breath, will not result in you having a heart attack. Also, although a panic attack can often be frightening, it will not cause you any physical harm. People who have had panic disorder for some time usually learn to recognize this ‘heart attack sensation’, and become more aware of how to control their symptoms. Panic attack symptoms usually peak within 10 minutes, with most attacks lasting for between 5 and 20 minutes. Some panic attacks have been reported to have lasted up to an hour. However, it is likely that the reason for this is due to one attack occurring straight after another, or high levels of anxiety being felt after the first attack. Panic Attack symptoms can feel so intense and out of your control that you may feel detached from the situation, your body and your surroundings. It can almost feel as if you are an observer, making the situation seem very unreal. For details about a programme to consider, try this link.